The first smoke was reported on Sunday, 14 January 2018. The town of Montagu had no idea what was about to happen next. For roughly one week, the flames engulfed Montagu, leaving most people with a very uneasy feeling. As the fire increased in size, so did the number of fire-fighters from different parts of the Western Cape. With the Cape Winelands Fire Services in charge, the town knew they were in good hands. From helicopters water bombing the hard-to-reach places with their 1,000 litre buckets, to large red fire engines that we all admired as children, no expense was spared to deal with this very serious threat. It has been a busy year for fire-fighters across the country, with the dry conditions, severe winds and water shortages not helping. 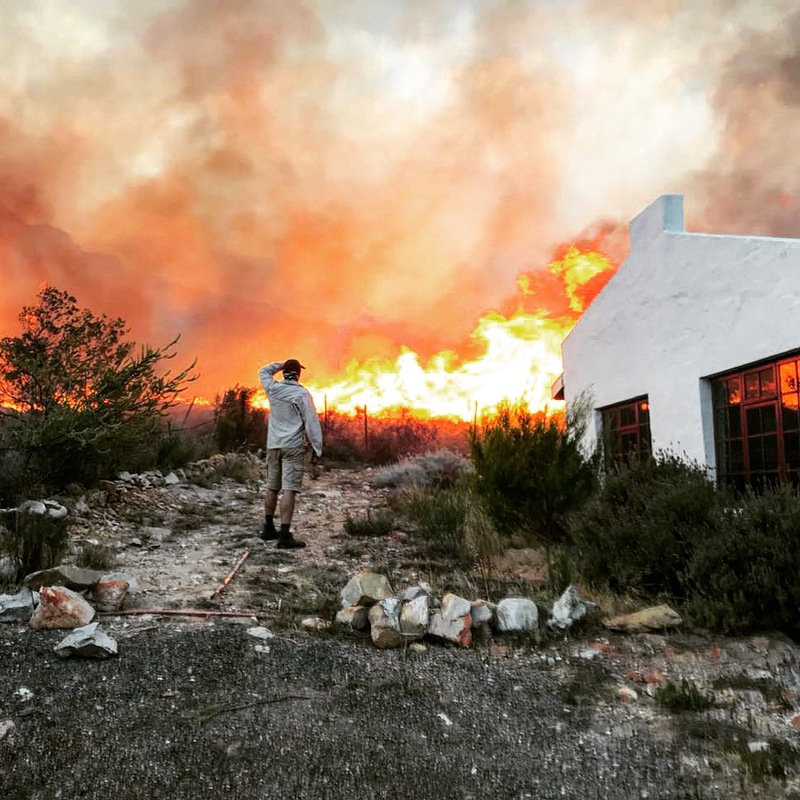 Through what can only be described as a minor miracle, there were no reported injuries or major structural damage to property after this major Montagu fire. The sheer size of the flames, reaching heights of 20/25 metres and the fire line of up 11 kilometers may give you some idea of just how big this fire was. Probably the most notable thing that became evident after this event was how the town of Montagu came together in support of each other. Hundreds of volunteers arrived from all corners of town to assist in any way possible. The generosity of local businesses and individuals was truly amazing. With 75 fire-fighters needing food, water, towels, soap, showers, accommodation and more, Montagu came to the table in abundance. Several photos were gathered from Facebook and a photo gallery created to show the severity of this fire, you can see the photo galley here. How do you thank those who saved your lives and your livelihoods risking their own life? It feels impossible to express the gratitude. From the deepest depths of our hearts we thank every person who partook in saving not only our farm on the boundary of Montagu West, but also the rest of Montagu West. Whether you gave your physical sweat and blood, machinery, tools or food contribution, or encouragement and prayers, everything made the difference between the worst case scenario and the best case scenario. We thank you God, friends, community, firefighters, volunteers and boerevereeniging for the best case scenario. We could have lost it all and so many of our neighbors the same. The surrounding fynbos and mountains will take a long time to heal but as we see it come back in time let us remember every day the compassion of you all and the miracle we have witnessed. When I close my eyes I see fire, but in my heart I see the love everyone has given. I remember, there was one moment when I just stood still and saw everyone fighting together, my eyes filled with tears, then continued again. To all those who were involved in beating this one, be it through actual fire-fighting, helping to vacate houses, or your generous donations, you know who you are. Montagu thanks you!